Weary of constantly swapping out my favorite headphones with a gaming headset for multiplayer games, I took a look at three great add-on mics. Depending on your setup and preferences, one of these premium mics will have you serving and receiving salt without sacrificing sweet audio quality or comfort. 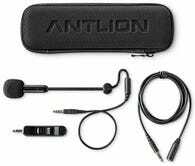 I tested the Antlion Audio ModMic 5, Massdrop MiniMic, and the V-Moda BoomPro, all of which had comparably excellent sound quality. It’s the features, nuances, and user-preferences that separate these three contenders, so I’ll be focusing on those attributes. 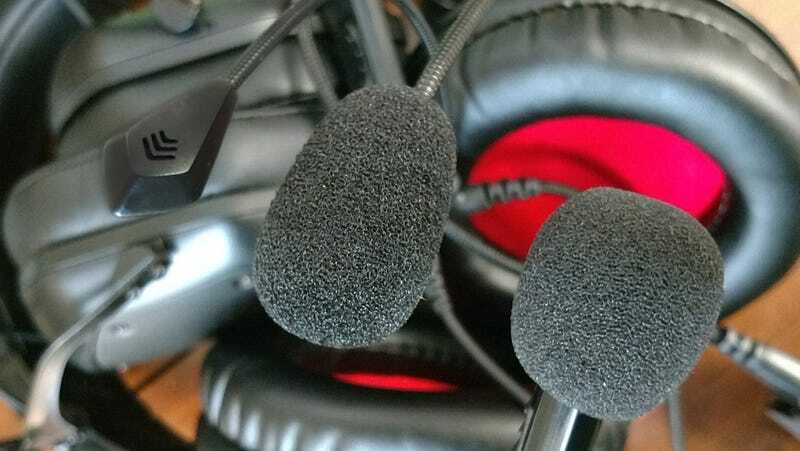 The Antlion Audio ModMic 5 is the most pricey add-on mic I tested, but don’t let the $70 sticker scare you away - a higher relative price is the only negative I can throw at it. The ModMic 5 was compatible with every set of headphones I got my hands on. The mount uses double-sided tape stuck to any 1cm diameter flat surface on your headphones. The magnetic separator allows for rotation out of the way, easy removal when you’re done chatting, and precise reattachment that won’t have you fiddling with mic placement. Antlion includes one extra mag mount for another set of headphones, and three extra adhesive dots. Cable management is accomplished by ten tiny plastic clips to bind MidMic’s cord to your headphone cable. There’s also a trim-to-length sleeve included if you need something more robust. I did not. Core features include an inline mute switch and an on-boom switch to choose between omni and uni-directional microphone modes. The ModMic 5's boom is stiff and sturdy, measuring seven-inches when adjusted to its longest reach. It takes effort to bend and is difficult to adjust when on your head, but remains locked in position even after tossing it on the desk time after time. The pop filter is large, and very functional. The ModMic 5 was the least affected by mouth wind from “P” and similar sounds, albeit by a narrow margin. Antlion even includes a zippered travel and storage case, though once my ModMic was adjusted to my liking, it wouldn’t fit back into the case. The least expensive add-on microphone I checked out, a Minimic is packed with value at just $25. Like the ModMic 5, Massdrop’s Minimic mount attaches to a flat surface on any headphones with a double-sided adhesive dot. 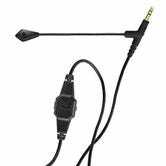 The MiniMic mount uses a hook-and-loop attachment point that makes it the most secure add-on mic in the group. It was compatible with every set of headphones I had access to. Small silicone cable ties help you bind cables together. These work fine, but it’s not the most elegant solution, and they frequently got hung on my shirt when I turned my head or spun in my chair. The Massdrop Minimic is uni-directional by design and is controlled by a single volume / mute slider on the cable. Minimic’s boom is very easy to bend and manipulate, but was prone to drift out of my preferred position during use when fully extended. This is partially due to it being the longest boom I tested at 8-Inches, adjusted to max reach. Removing the mic and lying it on your desk usually results in some loss of set position. The Minimic’s pop filter is comparable to the ModMic in both size and excellent audio reproduction. At $30, the V-Moda BoomPro is an easy purchase decision for owners of V-Moda headphones. Unlike the ModMic and MiniMic, the BoomPro attaches via 3.5mm jack, making it compatible with most headphones that use a detachable cable. The V-Moda Crossfade II, Beats Solo, Monster DNA, are a few popular examples. It is incompatible with headphones that lack a detachable audio cable, or headphones like my AKAI studio monitors that use a deeper twist-lock 3.5mm input. The 3.5mm mount is surprisingly sturdy and wiggle-free when paired with my Crossfade II wireless headphones. With the V-Moda BoomPro, there’s no risk of adhesive residue or need to permanently stick a mount on your premium headphones. No cable-management is included because the BoomPro’s braided cable performs double duty as your audio input and mic cord. This feature alone makes the V-Moda BoomPro one of my favorites. The same cable includes separate inline volume and mic mute controls. The V-Moda’s boom was the shortest of the group at only 5-Inches. This gives it a slick appearance (the only mic I tested that didn’t make me look like an eighties movie air-traffic controller), but severely limits its reach. The boom is easy to bend and manipulate, yet didn’t droop much during use. The BoomPro is an omni-directional mic with no pop filter, but sound quality was still comparable to its peers with only slightly more noticeable mouth wind noise and a little background noise in abnormally loud environments. My ears put the BoomPro’s voice quality at the top of the heap by narrow margins. After testing concluded and my notes were made, I found myself preferring the Antlion ModMic 5 with studio monitors while gaming at the office. I prefer V-Moda’s Crossfade II wireless headphones for day to day use, so the V-Moda BoomPro became my go-to with them. While those naturally became my preferences, I’ve confidently suggested the Massdrop MiniMic to two friends who wanted a great universal add-on mic at the best price. Honestly, the only wrong decision here is to continue hot-swapping your audiophile cans for a gaming headset.